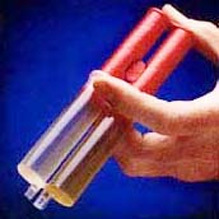 Disposal & Dual Syringes, Plas-Pak Industries | J. Dedoes, Inc.
As an authorized Plas-Pak Industries distributor, we carry the full line of Plas-Pak Industries products including Syringe Style, Ratio Pak®, Static Mixers and more. Contact us for more information. Versatile for paste and gel products. Our syringes are designed as primary packages that go through distribution filled. We currently supply millions of syringes to the veterinary pharmaceutical (single dose and Dial-A-Dose® syringes), pesticide, testing and sampling, dental whitener, and adhesive markets. 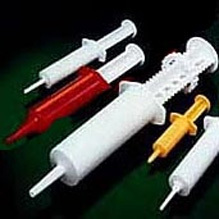 We are one of the largest supplier of dual syringes in the world. 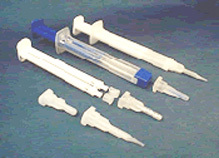 These syringes are used for two part adhesives in the DIY retail and automotive repair markets. Our smaller dual syringes, with attachable static mixers, are used for highly effective two-part dental whiteners, dental resin cements, topical applications, and hair care products. We make a variety of special cartridges used for veterinary probiotics, nutritional supplements, DIY adhesives, and pesticides. The cartridges are driven by low-cost manual guns, and the cartridges range in size from 15cc to 300cc, with a variety of nozzle options for almost any application. 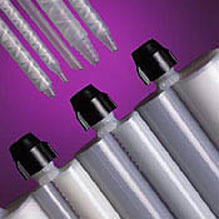 Plas-Pak is one of North America’s largest suppliers of multi-ratio dual cartridge and static mixers, used primarily for adhesive dispensing in the construction, automotive, and industrial design markets. 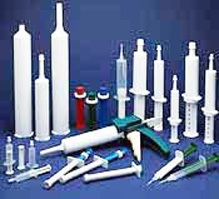 We manufacture enema nozzles, vaginal applicators, medication dispensers, and a variety of syringes suitable for dental applications, lotions, hair care products, and other dispensing applications.